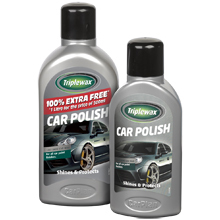 Triplewax; The Original Car Polish! The unique formula combines three of the world's finest wax extracts to provide the original Triplewax protection and an unsurpassed shine, that protects all year round. Triplewax Polish is easy to use, requiring minimal rubbing for maximum results. Protects paintwork from weather conditions and road grime. Suitable for all vehicle paint finishes, including metallics and pearlescents.